Clawtooth at Hair Fair is Fabulous, Darling! Bubbles Clawtooth of Clawtooth by Clawtooth has 4 fabulous long hairstyles at Hair Fair 2011! Darling and Dream Weaver both feature a slightly longer fall on the left hand side, Darling has side-swept bangs, while Dream Weaver is parted on the right with no bangs at all. Pretty Words is an ultra-long style, with side-swept bangs like Darling, and a second attachment point for the extra long piece. Take it Easy is likewise an ultra long version of Dream Weaver and also makes use of a second attachment point to add the extra length. I love the soft wisps and casual feel of these styles, which are suitable for both contemporary and retro styling. Try a free demo to see which style needs to go home with you! Don’t forget that all Hair Fair 2011 hair styles benefit Wigs for Kids, so you can do good and look fabulous, just like Bubbles! feeling I get from these hairstyles. Many times I’ve stood on the deck of a ferry boat with the wind whipping my hair. wrapped one shouldered bodice and split skirt with an optional train. Both evoke the elegance of a byegone era and yet would be perfectly suited to any event today. The lovely and fabulous Bubbles Clawtooth of Clawtooth by Clawtooth has done it again! 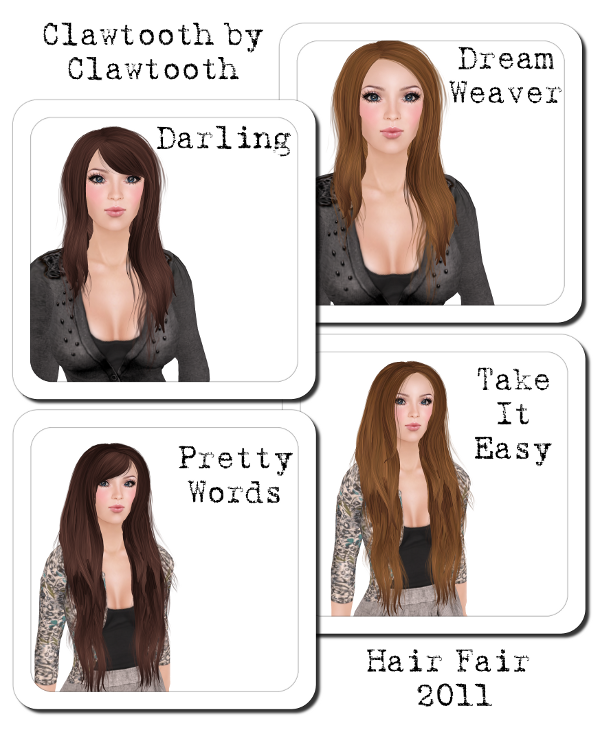 Five brand new hairstyles available at Hair Fair right now! There’s a style here for any occasion, as always with a vintage feel that still works well with anything in your wardrobe. From the top left, My Shilova is a cute short style, with side swept bangs pinned back. Rockin Rolls features divine Victory rolls and falls smoothly over the shoulders. I featured You’re a Star in one of my previous hair fair posts, this one channels the fabulous divas of the silver screen like Veronica Lake. So glamourous. French Connection just may be my favourite of the five, with a simple colour change beret, side swept bangs and just the right length. I’m ready to go sit in a Parisian café with my sketchbook! Last but not least, Turnip Sorbet is a mid-length hairstyle with soft waves and blunt bangs. Hair Fair 2010 – Post 3 Waka & Yuki, Clawtooth by Clawtooth, Surf Co.
Three more Hair Fair new releases, starting with the donation item from Waka & Yuki, New 148. I love this short curly style, I got it in pack A which includes 4 colours, 2 browns and 2 blacks. The ever fabulous Bubbles Clawtooth released 5 new hairs, more of which I will show you in another post. Shown is You’re a Star, a lovely soft long hairstyle that falls over the shoulders and frames the face. that I love to wear. Top: Whippet & Buck – Claven Lace Blouse (noir) LeLook exclusive! Apatia Hammerer has long been known for her original hand drawn clothing, at her two stores Pig and Thimbles. Unless you haven’t been paying attention to Second Life fashion blogs at all over the past year, you will have see her suspender socks many times! As an ardent lover of argyle, I was so excited when I heard Apatia was working on argyle socks. They are out now in store, in an astonishing 30 colour combinations! Apatia was kind enough to drop them on me, and once I was finished squeeing in glee, I started making outfits based on them. With so many choices of colours it was hard to narrow it down to just 3 to build outfits around for this post. On the left I started with the Pig Argyle socks in Bertram, pairing them with this Pig Sing Sing cardigan in raspberry, and the Bobo Party Sweater skirt from Thimbles in white. The Clawtooth by Clawtooth hairstyle Woman of the Year in Delicious Wine was one of two for this week’s 50L Friday. The Vaudevillian shoes from Anexx and the Celeste glasses from PrimOptic finished of the look. In the centre I went with the socks in Eloise, and chose the Long Island cardigan in deep teal, also from Pig. I tried on a bunch of shorter skirts, but settled on this grey pleated skirt from Niniko, with a fri.day Cami tucked under the cardi. I bought Those Shoes from Smersh a few weeks back after seeing them in one of Apatia’s ads. Lamb’s Stargaze hair in Kitkat with bowler hat topped the outfit. On the right I started again with the socks in Zigfield, and picked out this Blackbeautyberry mini dress at Thimbles to go with them. Clawtooth by Clawtooth had this hair with hat out for Stumblebum some months back, called Love Cuddles, I’m wearing it in Classic Brunette. The Classy Lady pearls in Ebony from Ticky Tacky, and the new Zimmy flats from Shiny Things to accessorize, and this very simple outfit was done.